It's always nice to have a little time between round robin projects to work on some of my own projects. 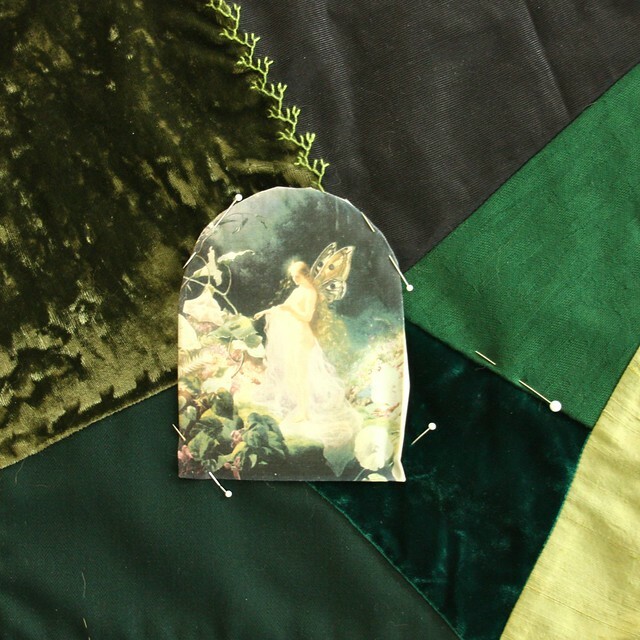 With Spring at the door, I'm craving green, so decided to get my fairy block out and work on a ferny seam. I love how versatile feather stitch is as a foundation for leafy stitches! This is the block it is on. I've got lots of ideas for it that are finally coming together after *years* of contemplation. It's funny how sometimes you can envision a project yet not actually see how to make it happen. I'm glad that this is coming together at long last! 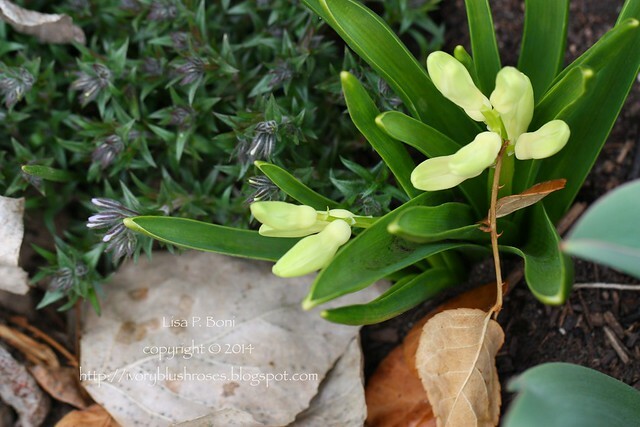 Along the front walk, all the hyacinths that I replanted are beginning to bloom! They are so happy to have more room! 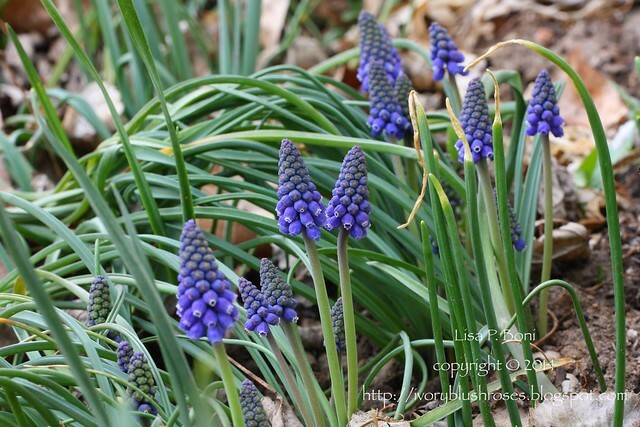 The regular hyacinths are also starting to blossom and the buds on the spring phlox indicate that it won't be too long until there is a nice mat of pale blue blossoms! Time to get those fall leaves out of the beds! The rest of the yard is still brown, but this little bed along the front walk is nicely protected and gets the mid-day sun. It is such a joy to see these little bits of spring shooting forth after our long cold winter! Love your fern ... It looks like it was woven into the fabric! 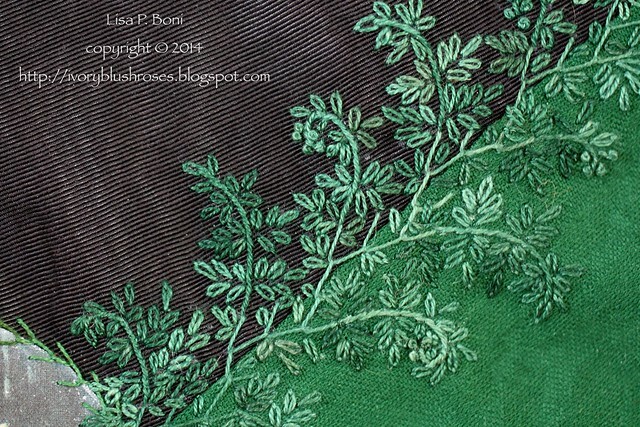 Lisa, I just gasped when I opened this post and saw all those lovely, lacy green leaves! You have such a talent for stitching and photography and I love your blog! I should comment more but please know that I'm a loyal reader and fellow crazy quilter who is inspired by your beautiful stitches! And what a beautiful start it is! Lovely. I look forward to seeing the rest!